Hazes have always been a favourite among cannabis lovers due to their incredible potency, superb high and outstanding flavour. Top Hazes like the famed Amnesia Haze may require a bit more attention along with longer flowering which makes them perhaps not the best strains for beginners. More experienced growers however happily trade the little more effort required for a big reward at harvest time. Cannabis enthusiasts love Amnesia Haze, a sativa that many consider one of the most potent Haze strains. Good yields, an amazing flavour profile and a superbly uplifting Haze high can easily explain her immense popularity and the fact that she’s still a favourite in the coffee shops of Amsterdam. The original Amnesia Haze genetics has been traced back to Jamaican and South Asian landraces. With their Amnesia Haze XL, Zambeza brings us this legendary Haze in their XL version where they only used the best genetics from the original Amnesia Haze. Growers know that Hazes usually take somewhat longer to flower as compared to some other strains. Amnesia Haze XL isn’t an exception here with a flowering time of approximately 65 days. On the other hand, take into account that Amnesia Haze XL can yield as much as 600g/m² when grown indoors which makes her flowering time still more than acceptable when seen in relation to her good yields. Indoors, Amnesia Haze XL won’t exceed her maximum height of 130cm. She’ll likely keep at or near 100cm when she grows. This makes Amnesia Haze XL still manageable for most growing locations. Outdoors, in ideal conditions and with plenty of sunlight, Amnesia Haze XL can grow to small monsters of 200cm or more where she can yield a staggering up to 700g per plant. Smoking Amnesia Haze XL won’t leave a doubt about that we’re dealing with a true cannabis legend. Her excellent flavour that blends citrus and lemon flavours with some spiciness makes for a very pleasant smoke experience that every cannabis enthusiast will love. Her superb Haze high is unlike any other, she makes for an extremely potent smoke thanks to a good 21% of THC as measured in the lab. She’ll give you a very euphoric, happy and uplifting high as only a first-class Haze can. Rest assured you will likely not need more than a hit or two and Amnesia Haze XL will put a big smile on your face! Many cannabis cultivars love Hazes because they make for an outstanding smoke with an incredible high and equally great flavour. 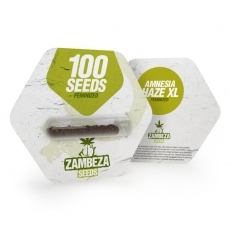 Zambeza’s Amnesia Haze Bulk XL available in packs of 100 seeds is a great choice for the grower who wants to stock up on one of the finest Hazes available!